In his political campaigns, Maricopa County Attorney Andrew Thomas has fashioned himself as a man of law, a prosecutor offering no tolerance to those who step past certain boundaries. But on Monday, hundreds of lawyers gathered in front of the county’s main courthouse in downtown Phoenix to tell Thomas they believe he has crossed a line himself with his an ongoing war against some of the area’s most-powerful judges. In recent weeks, the prosecutor has launched criminal investigations or leveled felony charges against several Superior Court judges, mostly for decisions they made from the bench. Ryan’s brother is Superior Court Judge Timothy Ryan, one of the ranking members of the Superior Court bench Thomas has not accused of wrongdoing. But Tom Ryan said the rally was not about personal grudges, but about righting wrongs. He also emphasized it was not a partisan event. Like Thomas, Ryan described himself as a lifeline conservative Republican, but he said he has had enough of the prosecutor’s antics. The rally drew more than 300 protesters, most of them attorneys or legal professionals but also some local activists who brought their own complaints against Thomas and his ally, Sheriff Joe Arpaio. Despite the crowd having mixed agendas, organizers and speakers tried to keep the rally focused sharply on Thomas’ battles with the judiciary, saying the criminal investigations of judges are unprecedented and must be stopped. 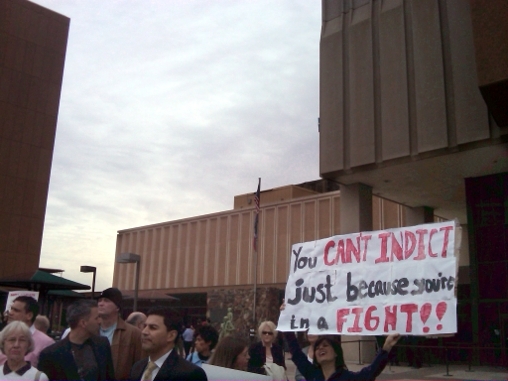 The rally came in the midst of a major legal assault Thomas launched in the past month against the majority of Maricopa County’s leadership. As part of the campaign, Thomas and Arpaio have filed a federal lawsuit against 12 county officials, including four judges, accusing them of engaging in a massive conspiracy to diminish the powers held by the two men. A week after filing the lawsuit, Thomas indicted two of those officials on charges of fraud and corruption. They have since pleaded not guilty. But it was the felony charges Thomas filed on Dec. 9 against Superior Court Judge Gary Donahoe that outraged so many local lawyers. Thomas accused Donahoe of obstructing justice and accepting bribes in a case earlier this year where the judge shut down an investigation by the sheriff’s office into other county officials. Essentially, Thomas alleged that Donahoe killed the investigation so those officials would move ahead with plans to build a new courthouse for the Superior Court. The charges against Donahoe were incredibly timed. They came just two weeks after the judge made another decision from the bench that sent one of the sheriff’s own officers to jail for contempt of court. It was a decision Thomas’ allies attacked as politically motivated. The charges also followed other high-profile decisions the judge made against Thomas and his office. The attorneys who gathered Monday said they believed Thomas was abusing his prosecutorial power to go after judges who had ruled against him. While the lawyers who spoke represented an array of practices – from plaintiffs attorneys to public defenders – a spokesman for the county attorney tried to lump them all together as “defense lawyers” and therefore natural enemies of a tough prosecutor. But the rally outside the courthouse was anything but normal. Many of the attorneys who spoke at the event marveled at just how unusual it was to see such a large and diverse gathering of lawyers, a profession that tends to push paper rather than protest. “It’s about time,” said Robert McWhirter of the county’s legal defender’s office. In terms of size, this rally trumped another one held two weeks ago at the same location by a much different group. Employees from the sheriff’s office rallied outside the courthouse Dec. 3 to protest a decision by Judge Donahoe to throw one of their colleagues in jail for contempt of court. The rally, surprising then for its size, brought out about 100 uniformed men and women. At the rally, Belanger compared the attorneys to sparrows chasing away a dangerous hawk. He said he was proud of the outcome. He then asked the crowd to spend 60 seconds in silence in the shadow of the courthouse, followed by a recitation of the oath attorneys swear when they are admitted to practice in Arizona. Imagine the billable time for that assemblage!